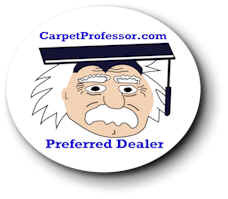 Carpet Foot-Traffic Test - How to select carpet wisely! What Grade of Carpet Should You Select? Here's a simple test you can take to help determine your level of Carpet Foot-Traffic. You can't choose new carpet wisely unless you select a carpet that is capable of withstanding your own specific level of foot traffic. I have created this simple test you can take to help determine your level of foot traffic based on several simple, but relevant variables. After you are finished, you can continue on to see which Carpet Fiber and specifications will best suit your budget based on how long you want your new carpet to last. By the way, if you have a pet or pets that has frequent urine accidents, then this foot traffic test is not going to be accurate for you. No carpet is designed to tolerate frequent wet pet accidents. No matter what carpet you choose, even if they say it is pet-accident friendly, you will not get the results you are hoping for. Spending more for a pet-accident friendly carpet is a waste of money. You will just spend more and get less. You would be better off buying a cheap carpet and padding and then plan on replacing your carpet and padding much more often. If your pet has more than one urine accident per week then you have a serious problem that needs to be considered before choosing new carpet. Pet urine accidents left unchecked can quickly ruin any carpet in short order, regardless of the carpet cost, fiber type, or quality level. To limit your financial loss from pet damage, you might be wiser to select a less inexpensive carpet and pad and plan on replacing your carpet and padding more frequently. It is very difficult to get urine odor and stains out of carpet regardless of the source (dog or cat). I have tried dozens of products and have found that few do any good at all. Of the products that do work to some degree, they are not a miracle spray that works instantly like those you see on TV. Removing urine stain and odor requires diligence, elbow grease and a commitment to addressing the problem quickly, aggressively and thoroughly. Once urine has soaked into the carpet and has dried, it is almost impossible to remove the odor completely with any product on the market today. Avoid padding upgrades. Don't waste your money on fancy or newfangled carpet padding in an attempt to limit the damage caused by excessive pet urine. Moisture-barrier, anti-microbial and odor eating pads are not effective if your pet has frequent urine accidents. You might be better of in the long run if you reduce your padding cost by using a lower grade pad. How long do you want your new carpet to last? With a serious pet urine problem, the answer should be 3 to 5 years. Now Add Up all your points and click on the appropriate traffic level below to go on to the next part of my Carpet Foot Traffic Test. It's getting harder to find a reputable carpet dealer these days! That's why I've created a special hand-picked list of over 400 locally owned Carpet Dealers who offer Free estimates, Knowledgeable staff, Honest measuring, Fair prices and Qualified installers.